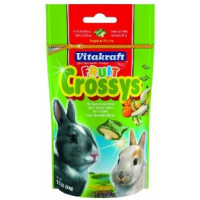 Vitakraft Rabbit Fruit Crossys Banana and Apricot 50g are delicious, crunchy little treats for your rabbit to enjoy. These yummy treat parcels each boast a mouth-watering banana and apricot filled centre, oozing with fruity goodness. This complementary food is ideal to give as a snack alongside your rabbits existing diet. Please note: Treats should be given sparingly and fed alongside a complete and nutritionally balanced diet. My bunnies & Pig loves these! and they're cheaper then other shops!